WE ARE NOT OPPOSED TO GRAFFITI AS AN ART STYLE… BUT DAMAGING PROPERTY AS A LIFESTYLE. Getting into the “what is art” debate is an ancient and slippery slope and it gets us nowhere. I don’t think anyone should make judgements like that. It’s very bad mojo for artists slam other artists work, so lets say “everything is art”. So… When does “everything is art” become “wrong” ? Not “bad” art… “wrong”? It becomes wrong when it is on someone else’s stuff … Its not what it, it’s where it is. THIS is the needle point of the issue. Talent can never get the respect it deserves by first creating a victim rather than a viewer. It may also be bad art for discounting itself. Work and talent should not be condemned to the obscurity and erosion. To take the art from here to the next level needs a shift in the way the artist thinks about their art as a legacy, and its rightful place in the history of art. “Respect” is a word we constantly hear from young graffiti artists we work with who want to have their work taken seriously. The “graffiti art-stile” is perfectly valid and deserves the chance to be much, much more… It’s such a shame it has to take a karmic low road and disrespect itself. Respect is also a two-way street, and if you are painting on someone elses stuff you are the one that is doing the disrespecting. You are also in real danger of becoming a victim of your own behaviour since Prop 21 “Increases graffiti vandalism penalties, making graffiti that causes more than $400 in damage punishable by a year’s imprisonment in county jail or between 16 months and 3 years in state prison.”…. you can top that $400 limit in ten seconds flat! Lets just move the goal posts a bit and see what happens? Lets put the work on a stretched piece of canvas. The work is transportable, ready to show to a wider audience and is available for sale if you want to be a breadwinning artist. The art is not under threat from urban erosion, subsequent cleaning or over tagging. Standing in front of a stretched 120z duck canvas and feeling the perfect “tooth” of the gesso under a brush is a humbling and magical experience that never gets old and one that brother and sister artists have shared for centuries. The artist can claim it as truly being his own work.. by right. From vision to varnish it belongs to you. Your name need not be a cryptic tag.. sign it with pride, you earned it. You’re not going to get thrown in jail, nor should you for following your passion. For any artist developing a serious relationship with making art this should be a lightening bolt from Zeus… and we are now talking artist to artist. 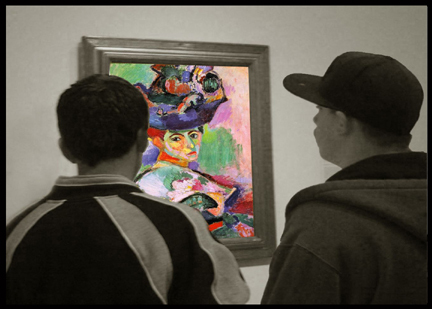 Madame Matisse introduces herself to a couple of young artists. BTW. This very painting caused scandal and debate for its rule breaking when it was first shown. I want to be clear that we are all for rule breaking in art. In fact I believe that most significant art breaks rules. The conversation that needs to happen is about humanity. Love the quote “Talent can never get the respect it deserves by first creating a victim rather than a viewer.” I am going to use this…Who do I give the credit too? http://www.bigpicturearts.com? Alison… Please forgive me for letting this slip by. Of course you can quote/use/borrow or steal anything for this site. We are all about making a change for good. BTW. you should get a copy of Julius Zsako’s book “Defacing America”, an eye opening work. Good luck and please contact me if there is anything I can help Fort Worth WAL with.